A concealed shower can be quite a bit of extra work, but the results are so worth it. They are some of the most beautiful and stylish showers out there, so if you take the time to get the job done, you are very unlikely to regret it. Of course, a concealed shower also means concealed valves, and as these are quite an essential part of the shower installation process, it is important to know how to do it correctly and safely, all while ensuring they remain fully concealed. This DIY guide is exactly what you have been searching for. What Does a Concealed Shower Mean? When people refer to a concealed shower, it means that practically everything is hidden safely in the wall, floor, or ceiling. So, you won’t be able to see any pipework or a unit, and the only things that tend to be visible are the taps, temperature controls, and shower head. It looks amazing, but having a fully concealed shower can be a little impractical. Many people go for what is known as a partially concealed shower, and this is where the shower head is on an adjustable rail. The adjustable shower head does make cleaning much easier (especially if you have pets or kids), but it doesn’t look quite as spiffy as the fully concealed variety. While the form that you go for is entirely your choice, it should be noted that the vast majority of concealed showers are power showers. If you are looking to install one of these, there will be electrical work required, and you must get an electrician out to do the work for you, or check over anything you have done before you can use the shower. There are some mixer shower valves that come with something called a fast fixing kit, and this is supposed to allow for the easy connection to the tails in one movement. Most showers have this option available, and they make everything so much quicker and simpler. If you have copper pipes, it should be noted that these will be fitted with compression or soldered joints. Flexible pipes, on the other hand, will be push-fitted together. These run two outlets, such as an overhead shower and a side shower, or even a bath filler. It will have at least two handles attached to the valve, and if this is the case, then one of them will be a diverter and the other temperature control. They are also known as a dual or twin shower valve, and are one of the most popular choices in modern bathrooms. Controlling the flow and temperature separately is incredibly efficient, and it helps to make things clearer for you. However, there are also two-way valves that allow you to use one handle to control both the temperature and flow while the other determines where the water will be going (another shower head, the bath, and so on). This particular type of shower valve tends to have three controls as opposed to two. It will allow you to run two of the outlets at the same time and each one of them independently, but this can depend on the manufacturer as well. They are also known as triple valves and have been referred to as recessed/built-in valves. They are usually designed to be hidden behind a wall so that only the controls are visible, and all modern models are thermostatic so that you have complete control over the temperature at all times. The handles usually work where one controls the flow, one is for the temperature, and the other divers the water to other outlets. It’s a handy and efficient process, especially with the extra handle. Once you have chosen your ideal shower valve, you can get to the installation process. Of course, the aim is to ensure that it is hidden, and we have the perfect way to achieve that for you. Time to dust off the toolbox and get ready for a day of hard work; DIY style. The best way to achieve the concealed shower effect is through false walls that contain all of the pipework and other components that you don’t want to be visible. These must be carefully constructed, and accurate measurements should be taken before you begin building them. You can use flexible connectors to feed the shower with hot and cold-water supplies, and these pipes tend to be long-lasting because of their flexible design. The hot and cold feed will need T-junctions to be put in place, and if you have plastic pipes connecting to copper tails, you should also ensure they are done so with the appropriate fixing kit. This is something you can check with your local hardware store, as it often depends on the piping. The copper tails should be passed through a backboard to ensure that they are in the exact location they need to be for when the plasterboard is fitted over them. You must make sure that none of the pipework is able to move, as stability is key for a secure and safe shower system. Once the plasterboard is installed, the valves can be as well. It’s a very simple process in terms of the number of steps, but it does require you knowing the ins and outs of your plumbing system, where everything is, and also being confident enough to build false walls in your bathroom. If you decide to undertake this project, do so slowly and with great care. If you feel lost or unsure at any point, call a plumber in to do the rest. It’s better to be safe rather than end up with a leaky valve. 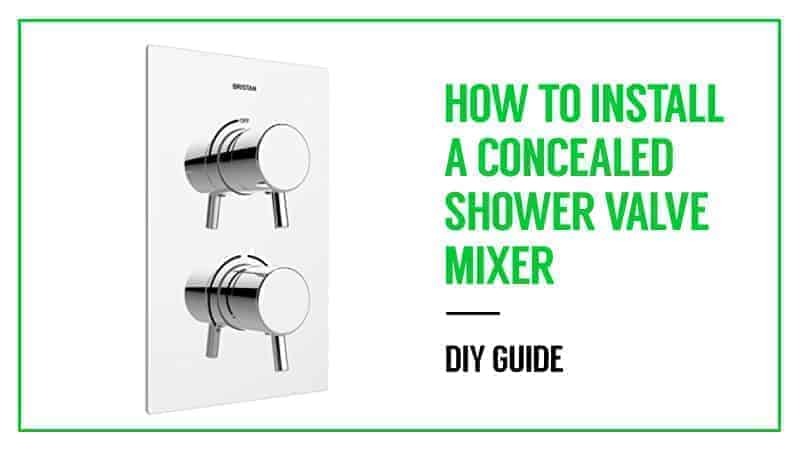 Hopefully, this guide has been able to teach you more than just how to install a concealed shower valve, and you have learned a lot more about how they work as well as what they are made up of. Having a concealed shower might seem like a lot of work at first, but with this guide, we are able to ease you through the process so that you can achieve your dream bathroom without too much stress and hassle. What did you think of our concealed shower valve installation guide? Did it have everything you expected, or are there areas that left you feeling stuck? We love hearing from you, so feel free to leave us a message in the comments below.